Home > Hypnotherapy > Psychotherapy, Counselling or Hypnotherapy? With so many different psychotherapeutic therapies to choose from, deciding which one is right for your particular issue can be challenging. Psychotherapy and counselling come under the umbrella of talking therapies. Being able to talk about whatever is on your mind whilst someone is giving you their full attention and really listening is very healing. Very often it is this desire to be listened to in a non-judgmental way that takes a person to one of these therapies. Free treatment can often be obtained through the NHS. Some places of work also now offer their staff the opportunity of free or low-cost treatment with a counsellor. In both these cases, you will probably be offered a maximum number of sessions. There may also be a waiting list.Whilst psychotherapy, counselling and hypnotherapy are separate disciplines, in reality therapists are often trained in more than one of these. Some therapists are trained in all three. In general terms, counselling focuses on the problems you are facing now. You may be going through a crisis, a major life event or be in the throes of making an important decision. In the counselling arena, you can talk about your feelings about both yourself and the situation you are going through. You will have the opportunity to talk openly. Your counsellor may gently encourage you to focus and explore things more deeply, or may facilitate you in making decisions. Good counselling will feel supportive whilst not imposing personal opinion on you. Many people find counselling helpful both with everyday problems and more major life crises. People often find counselling useful when they are coping with bereavement, relationship difficulties and loss. 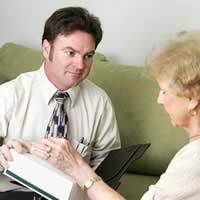 As with counselling, there are different styles of psychotherapy. The basic aim of psychotherapy is to help you understand yourself and your motivations more fully. To facilitate this, your therapist is likely to help you make connections between your current feelings and behaviours and the past. Depending on their training and personal preferences, therapists can remain detached and analytical whilst others may be more involved and obviously supportive. Your therapist may say very little throughout treatment, or may be more probing or confrontational. There are some counsellors and psychotherapist who specialise in specific areas. These include drug and other addictions, alcohol problems and sexual abuse. Unless you have been referred to an NHS clinic, you will usually have to pay for psychotherapy. There are some issues for which hypnotherapy is very well known as a treatment. These include habit-breaking, weight loss and phobias. In practice, hypnotherapy can be a treatment for many of the issues for which people consider counselling or psychotherapy. These include confidence issues, anxiety and panic attacks, sleep disturbances and some forms of depression. Some hypnotherapists also work in the areas of sexual abuse and addictions.Hypnotherapy comes under the umbrella of brief therapy. In some cases, only one or two sessions are needed. If you need more consultations, you should be feeling that you are making the progress you want within a few sessions. So which therapy do you choose? Since many situations can be dealt with by any of these three styles of therapy, choice may come down quite simply to personal preference. Some people feel they would benefit most from being able to talk in an extended way. Others feel the in depth personal exploration of psychotherapy suits them. Still others favour the direct approach of hypnotherapy. Whichever you choose, it would be wise to talk it through with a therapist first. Some issues require specialist knowledge or training which not all therapists have. On speaking to you, a hypnotherapist might feel your issue would be better dealt with by either counselling or psychotherapy. Sometimes it becomes apparent that a person is at a time in their life when they simply need to talk. All therapies have governing bodies with information about their particular therapies. They will also be more than willing to tell you whether that therapy is right for your issue. Do not forget that in most cases, personal recommendation is all you need, so ask your friends.